Samsung reported some numbers late last week, and their miss started chatter on smartphone saturation. In the worldwide smartphone market, vendors shipped 216.2 million units in 1Q13, which marked the first time more than half (51.6%) the total phone shipments in a quarter were smartphones. Q1 represents the first time smartphones reached 50% of shipments. This does not sound like saturation. Of course region-to-region differ. Western Europe sure looks like a saturated market, experiencing a large decline in the Q1. 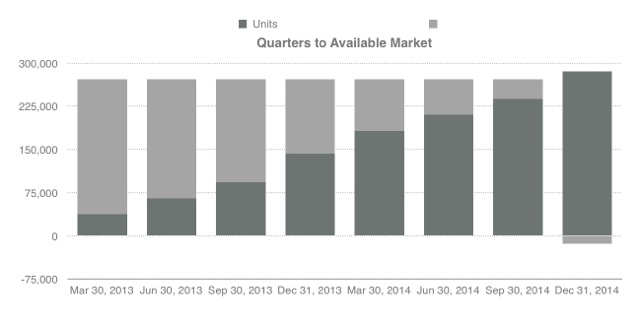 Despite the numbers, Apple's concern is higher-end market saturation. An interesting assessment of the "Addressable market for high-end phones" was performed by Benedict Evans and estimates the market, at the end of 2012, to be about 1.6 Billion. Not a bad market size potential, assuming its valid. Samsung and Apple basically control the high-end market. A joyful estimate would assume the iPhone to capture between 40-50% of the 1.6 billion. This would assume 640-800 million units. Leaving room for healthy, low double digit, iPhone growth for over two years or so. The rise of the Chinese white-label phones, and there good-enough status, while being extremely inexpensive, highlights the importance of the high-end market. If de-commoditization does not take place, the once high-end is no more. Fortunately, Apple is very good at de-commoditization. (Anyone who doubts this can simply look to the PC market.) The role of iOS 7 de-commoditizes the mobile landscape Apple created. Unfortunately, any OEM relying on a general OS will not be able to say the same. And the funny thing about commoditized consumer businesses, once people are familiar with the commodity they want more. They want differentiation. They gravitate to the de-commoditized product.